Our PR-25CU Copper Tipped RTD Probe combines the ease of use and robustness of our PR-21 RTD and adds a copper tip for improved response time. When trying to measure the temperature of objects like bearings and motors where contact is limited, the copper tip provides improved sensitivity. 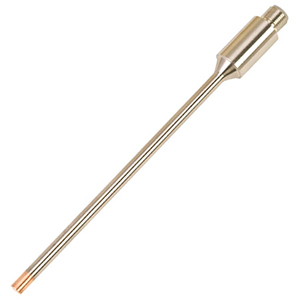 In thermowells where the contact between the sensor and thermowell bore is limited, copper tipped sensors can provide improved response and accuracy over standard immersion probes. The ¼” diameter PR-25CU RTD has a response time of approximately 3.25 seconds for 50% response, 4 seconds for 63.2% response and 7.5 seconds for 90% response in water flowing at 3 feet per second. The 63.2% response time is approximately 33% faster than our standard PR-21 M12 Style Immersion RTD, and less than ½ the response time of our High Temperature PR-26 M12 Immersion RTD. The PR-25CU, like all of our M12 enabled probes, comes standard with a 4-wire, 4-pin, M12 A-Coded plug connector for easy assembly to extension cables. This allows it to be used in any 2, 3 or 4-wire measurement system for maximum flexibility. When ordering your PR-25CU sensor, don't forget your extension cable. Omega offers a wide selection of extension cables including over molded PVC, Polyurethane and Silicone cables, as well as customized cables in a variety of materials with optional stainless steel braid or hose for improved mechanical protection, and a wide selection of instrument connections. Connect your PR-25CU RTD sensor to one or more of Omega's wide variety of in-stock controllers, data loggers, transmitters, hand held thermometers, PLCs, or other measurement & control products to complete your measurement or control system. Omega offers a selection of programmable and fixed range transmitters that can be connected directly to the M12 connection of your PR-25CU sensor. There are also wireless transmitter options available. Metal Parts: 316L Stainless Steel Sheath and Housing, Copper Plug at Tip. Note: Standard; For lengths other than 6", change “-0600” in model number to required length and add $1 per inch greater than 6", (example: 18" = 1800).